Luton Town have confirmed that Mick Harford will remain in charge of the club until the end of the season. The Hatters legend, who turns 60 today, took over from Nathan Jones last month, and together with assistant Steve Rutter, first-team coach Inigo Idiakez and goalkeeper coach Kevin Dearden, have led the side to the summit after five league wins from six. 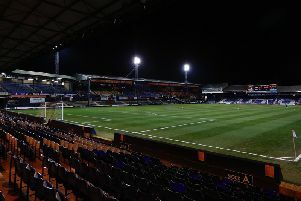 He could see the club set a new record of 20 Football League games unbeaten at Fleetwood this weekend, as chief executive Gary Sweet said: “We are in this wonderful position where we have a loyal servant of the club who was prepared to step in and do whatever was asked of him at what many believed was a time of need. “It was, in the sense that we needed someone we could trust implicitly to do what was best for Luton Town Football Club while we, as a board, had to focus 100 per cent on the council committee meetings for the planning applications for Power Court and Newlands Park. "Those two things, as we prepare now for the second leg on March 11th, are the most important fixtures for the future of the club. “Having such an experienced manager as Mick, who already knows and has the total respect of every member of our squad because he helped sign them, has enabled us to commit fully to preparing properly for those meetings, and the subsequent MIPIM exhibition in Cannes which is crucial to the development process for both projects. “As custodians of the club we can’t thank Mick enough for what he has already done, and will continue to do with the help of our highly-skilled, unsung staff, until we reach the end of the season and can properly recruit the right manager to continue leading the team forward in the long-term. “The whole playing squad have been fantastic in their response to Mick, Steve, Ini and Kev over the past four weeks and we know that will now continue. “We hope that this confirmation that things will carry on just as they are will give every single member of the dressing room the reassurance to continue doing all Luton Town supporters as proud as they have been while, as Mick pointed out on Saturday, deservedly writing their own names into this club’s rich history. “We would like to thank every applicant who has taken time and trouble to express their interest in the vacancy so far and we will review our position, with those applicants in mind, towards the end of the season in time for a longer term managerial appointment ahead of the summer.